The cocoon stage of the winter moths currently emerging in southern Maine are in for a nasty surprise when 3,000 parasitic flies are released in south Portland. In its larval stage, moths feed on and damage oak leaves. The parasitic flies will lay their eggs on those leaves and be eaten by the moth. Those eggs will hatch and the larva of the fly acts a parasite on the host moth, eventually killing it as a highly effective biological control method. Entomologists with the Maine Department of Agriculture, Conservation and Forestry are preparing for a sort of coming out party next week when 3,000 parasitic Cyzenis albicans flies are released in South Portland. The flies have spent the winter buried and tucked into cocoon husks of the winter moth [Operophtera brumata] and once they take flight, the flies will be the front line offense in battling the destructive moth in Maine, according to Colleen Teerling, entomologist with the Maine Department of Agriculture, Conservation and Forestry. The winter moth is an invasive species that showed up in the United States and Canada in the early to mid part of the last century. It came from Europe. The winter moth caterpillars feed on the leaves of deciduous trees and shrubs such as oaks, maples, apples and blueberries, in early spring. Heavy defoliation for several consecutive years leads to branch dieback and tree mortality. Winter moth defoliation has contributed to tens of thousands of acres of oak mortality in Massachusetts and now there is oak mortality in Cape Elizabeth. 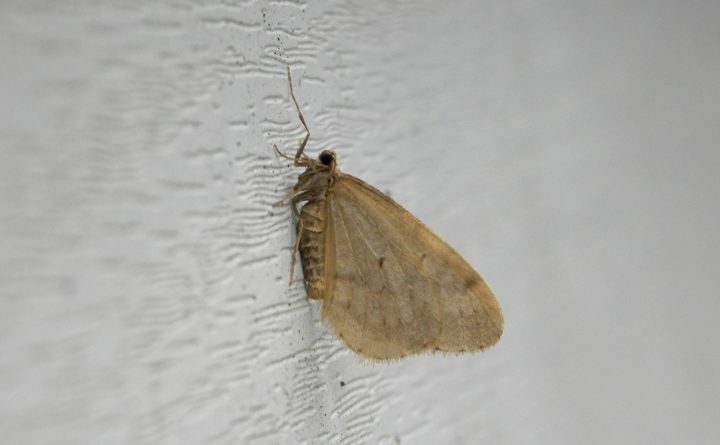 Winter moth defoliation was first recorded in Maine in 2012 and now the moths have been detected from Kittery to Mount Desert Island, according to Teerling. Adult parasitic flies are attracted to oak leaves that have been damaged by the winter moths and the female flies will lay their eggs on those leaves, where they are then eaten by the winter moth caterpillar. The fly eggs only hatch in the gut of the winter moth caterpillar, where they grow, pupate and feed on the caterpillar’s internal organs and body. Eventually, the weakened caterpillar falls to the ground, dies and the fly uses the body as a home for the winter to mature, emerging the following spring to start the entire process all over again. Last fall Teerling and her crew obtained 3,000 cocoons from the University of Massachusetts which is leading a United States Department of Forestry-funded study of the fly-moth relationship and producing fly-filled cocoons for use by state agencies like Teerling’s. Those are the males, Teerling said, and the females should be emerging from their cocoons any day now. The parasitic flies are not dangerous to humans, birds or any other critter, Teerling said. In fact, if a bird or other animal eats one of the fly eggs, it will not hatch — it only hatches in the stomach of the winter moth caterpillar. Teerling said the population of the parasitic flies and winter moths are carefully tracked in areas of the state where they have been released, including Cape Elizabeth, Vinalhaven, Portland, Kittery and Harpswell.